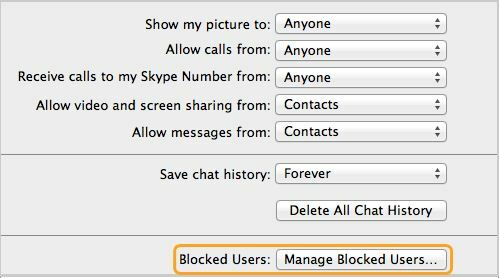 Skype’s privacy settings let you control who can contact you on Skype, and help you manage your conversation history and blocked contacts. When you first download Skype, by default, only the people in your contact list can see your profile picture, or share their screen or video with you. However, anyone who searches for you can call you or send you an instant message. You can change these settings at any time. 1 Sign in to Skype. From the menu bar, click Skype > Preferences… and select Privacy. The Privacy panel is displayed. Control who can see your profile picture. Next to Show my picture to, choose Anyone or Contacts. Control who is allowed to make Skype-to-Skype calls to you. Next to Allow calls from, choose Anyone or Contacts. Control who can call you on your Skype Number. Next to Receive calls to my Skype Number from, select Anyone, Known Numbers or Contacts. Anyone allows all incoming calls. Known Numbers mean numbers that are not withheld. Contacts allow calls from people in your contact list with a saved number. You can buy a Skype Number with a little Skype Credit. Learn more about Skype Numbers. Control who is allowed to send you video and share their screen with you. Next to Allow video and screen sharing from, select Nobody, Contacts or Anyone. Control who can send you instant messages. Next to Allow messages from, select Anyone or Contacts. In the sidebar, click Contacts, and then to the right, click Skype. Find the person you want to block in your contact list. Right-click the contact you’d like to block, then select Block [contact’s name]. To report a nuisance contact to Skype, check Report abuse from this person. Click Block. The contact is removed from your contact list and will not be able to contact you again. From the menu bar, click Skype > Preferences… and select Privacy. In the Blocked users box, click the contact you want to unblock, then click Unblock. The contact is added back to your contact list and can contact you. If you have a legacy Skype button displayed on your website, you can show your status so that anyone on the internet can contact you via Skype. Near the bottom of the Privacy panel, check Show my status on the web. Important: The legacy Skype buttons displaying your Skype status are no longer supported. Visit the new Skype buttons area to get your own customized button for your website or application.